The University of Wolverhampton’s occupational health courses are some of the longest-standing in the country and were among the first to gain Specialist Community Public Health Nursing (SCPHN) approval from the Nursing and Midwifery Council, after it took over registration of the profession. So the decision by senior lecturer Bashyr Aziz to stop taking new students on to the SCPHN OH courses and to develop something “radically different” that may or may not end up NMC approved is a hugely significant step. Not only does it throw down the gauntlet to the NMC over the future shape and direction of OH training, it brings into sharp relief the continuing concerns of many in the OH community that the shift to SCPHN status has diluted OH’s influence and profile in the nursing profession just at the point when, for government and employers, it is moving centre stage as never before. Aziz, for one, has made no bones about why he feels the course can no longer continue as it is. “Over the past year, I have felt increasingly concerned that SCPHN-OH courses were not keeping up with the rapidly changing needs of work and society, in light of demographic changes, evolving public health policy and new patterns of work,” he said in a statement on the closure of the course. While the intention is to have a new programme in place from September next year, Aziz was also candid that he had no idea whether it would become NMC approved or lead to SCPHN registration. It would probably be a multidisciplinary programme including physiotherapists, occupational therapists, rehabilitation specialists and “anyone else with an interest in health and work”, he said. News of Aziz’s decision sparked fierce debate among OH practitioners, as well as past and present Wolverhampton students, with 66 messages quickly being posted on the JISCmail forum alone. And it was clear that the issue of NMC compliance, and the worry that OH courses are being forced to become too generalist to fit into a SCPHN framework, was a key concern and frustration for many. Liverpool OH practitioner Frank Oakes did his diploma at Wolverhampton but then switched to a non-NMC accredited course at Birmingham University. “There were all these non-OH people sitting around me and it had no relevance at all to what I was doing for a living,” he says. Gloucestershire NHS OH nurse specialist Campbell Milne graduated from the Wolverhampton course in February and agrees that the lack of practical application was a frustration, but places the blame squarely on the NMC’s demand for Part 3 registration. “People can get qualified, with a qualification that meets the requirements of the NMC, and go out to work in occupational health and not have those core essential skills they need,” he says. Neil Loach, senior OH nurse at University Hospitals of Leicester, goes even further, arguing that the course was “hijacked” by the NMC and turned into a public health-­focused degree, concluding that Aziz’s decision is both right and brave. “It is a big gamble, and whether people will subscribe to the new course remains to be seen,” he says. 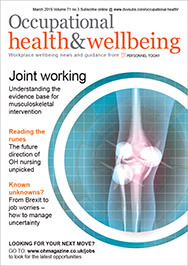 Milne, Loach and Oakes all argue that the way forward may be for closer links between the Faculty of Occupational Medicine and the profession, or even the creation of a new faculty or college. This idea, for some sort of Royal College of Occupational Health, is one that has been batted about for some time, with Cynthia Atwell, chair of the Royal College of Nursing’s Society of Occupational Health Nursing, among those who have mooted the idea in the past. It has also been suggested that the government’s idea for a pan-­industry Council for Occupational Health, which emerged from its response to the Carol Black report, could in time be a stepping-stone to the creation of a full-blown college. However, there would be huge issues around whether such a move would risk the profession losing its “nurse” identity, concedes Oakes. While such a move would, of course, be radical, where it would leave the NMC in terms of OH training is also unclear. In this context, while Aziz’s decision at Wolverhampton may of itself not change the world, its resonance could echo for some time to come.